Forever Young | Spa Inc.
New treatments and tools help clients defy signs of aging. Caviar lovers rejoice. Not only can they eat the rare and expensive delicacy, now they can have a facial with it. That's right. 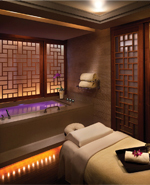 Customers at Chi, the Spa at Shangri-la in Vancouver, BC, can receive a 75-minute golden caviar facial. The treatment uses products which contain caviar extract. It activates skin cell metabolism and skin micro-circulation, softening lines and wrinkles and helping to prevent premature skin aging. "Caviar extract promotes the skin's ability to bind moisture and balances the moisture level," says spa manager Amy Berry. "It makes the complexion appear more balanced, even, and radiant." If apples are more to your taste, you can receive a Phytocell facial at the Fountain Spa at the Pillar and Post hotel in Niagaraon- the Lake, ON. A new anti-aging cell formula from Biodroga uses stem cells from a rare type of apple known as the Uttweiler Spatlauber which significantly protect the longevity of the skin's own stem cells and stimulates their activity. "The apple always has been synonymous with beauty and seduction, but scientists now have found evidence that apple stem cells (PhytoCell TM Malus Domestica) are an effective ingredient in anti-aging care, waking up sleeping cells, increasing metabolic activity, improving the skin's rhythm and counteracting chronological skin aging," says spa manager Karen Thomas. "Lines are visibly diminished, tissues are strengthened and the skin is more vital and fuller looking." These are just two of many new anti-aging treatments, products, and technologies that spas across the country are offering their customers. "People are looking for treatments that produce real results with no skin damage," says Lydia Sarfati, founder and CEO of Repêchage. "The trend in cosmetic chemistry today is to ingredients such as peptides that deliver signals to the cells. And they want to see improvements to all parts of the body." Peptides are amino acids (protein) that are linked together in a chain. Peptides have been found to improve cell growth and have a botox-like effect, firming and regenerating the skin, improving skin nutrition and generally preventing the skin aging process. Anti-aging treatments increasingly are incorporating the use of seaweed. Repêchage has developed a four-layer facial treatment. The first layer applies a C-Serum to the face and neck and décolletage and massage for about five minutes. A hydrating cream is then applied followed by a seaweed mask and then a mineral mask which is applied over the seaweed one. The mask is removed after about 15 minutes. "Seaweed benefits the skin in a myriad of ways including rebalancing, regeneration nourishing, detoxifying, mineralization, hydrating, purifying, and firming," says Sarfati. "Many skin treatments are short-lived but seaweed is one of the most widely used around the world today." Massage therapy today is being heavily influenced by Eastern traditions. Chi in Vancouver recently introduced three Wushu massages. The treatments are inspired by the stretching and body care methods of Wushu martial arts. Each treatment begins with stretching coupled with breathing exercises. A toxin release massage uses a bamboo rod for stretching and rolling over the muscles to stimulate relaxation, followed by a medium- to firm-pressure massage using Chi oil. A stress relief treatment uses Tai Chi massage to ease stressed nerves followed by a vigorous muscle-warming to release back and shoulder tension. Finally, a specialized problem areas massage uses effleurage to warm the muscles followed by massage techniques to locate energy blockages within the body. Trigger acupoint then is applied to release the energy in problem areas to create a better body balance. The Sante Spa and Cosmetic Laser and Vein Centre in Calgary offers a broad suite of services and technology designed to "bridge the gap" between anti-aging facial, body, and massage treatment and more medical botox, filler, and laser anti-aging procedures. This past year, the spa began offering specialty facials using an M-6 collagen activator, a new mechanical device that stimulates tissue in the face and neck, and improves blood flow and collagen regeneration. Early in 2013, the spa will introduce new equipment from Italy that provides customers with an assessment of their entire body based on weight, body mass index, and other factors. "Our Spa Slim Up station allows us to analyse your body on a technical level, including personal data and exercising activities, giving us the ability to recommend a program of personalized treatments which may require a combination of our latest technologies, that include the LPG Cellu M6, Slim Up Ultra, Big Steam and Hydro Spa," says spa manager Kim Hochstein. Introduced from Italy, Slim Up Ultra combines infra-red heat, ultrasound, and electro stimulation to firm and tone the skin, treat cellulite and reduce fat. Slim Up Lymphatic Drainage is a computerized compression therapy system, the latest in mechanical lymphatic drainage technology. Therapeutic benefits include cellulite prevention, reduced swelling, and a boost to the immune system while eliminating toxins. Introduced from France, the LPG Cellu M6 Lip massage is a non-invasive procedure in which various areas of the body can be targeted for treatment of cellulite, excess fat, and lax skin. "This is a whole new field in Canada," says Hockstein. "It has required a very significant investment, not only in terms of money but also in training our staff. A lot of people are looking for help with their entire bodies, and that's what we now can provide." Sante also offers more medically-based anti-aging procedures such as botox and fillers, laser treatments to remove spots and surface layers of dead skin, thermage (the use of radio frequency waves to heat and firm the skin on the arms, legs, torso, and abdomen), laser hair removal, and treatment of varicose veins in the lower legs. "For anti-aging, when you combine all these things together it has a huge effect," says Dr. Wendy Smeltzer. "Having a medical clinic attached to a spa is a trend that has been developing in the industry over the last few years. Although these essentially are cosmetic procedures they need to be performed in an environment with physicians." The Fountain Spa has taken things one step further and developed a retreat program designed to help couples and parents and children improve their relationships. "You'll focus on all the good aspects that first brought you together, helping to build a stronger foundation for the days ahead—perfect for engaged or married couples, mothers and daughters or any two people who care about the well-being of their relationship," says Thomas. Most spas are focused on their services and procedures and on getting customers in the door, but few do anything to help customers as they leave. "They need to focus more on the departure, giving people information about how they can improve their diet, exercise, and lifestyle in general to complement and maintain the improvements they have achieved while in the spa," says Sarfati. "If you capture people as they leave they're more likely to return again. I think spas are really missing the point here and need to do more.